Beautiful skinny rhinestone belt 3/4" wide with fabulous studs. Alligator pattern on leather belt. 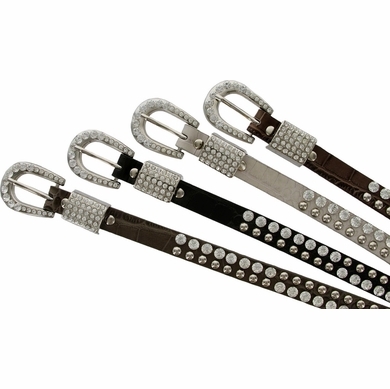 Silver plated secure buckle with rhinestones around and with a curve shape. Unique metal wide and thick loop and with crystal studs. 5 holes without studs around for a better and secured grip. Size available: Small/Medium = 33" to 35" and Medium/Large = 37" to 39". Sizing: Measure around where you wear the belt, with your pants on, and order that size in inches.